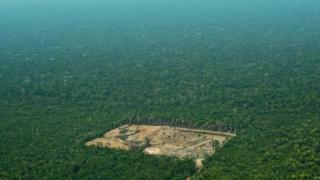 Deforestation of the Amazon rainforest in Brazil has hit its highest rate in a decade, according to official data. About 7,900 sq km (3,050 sq miles) of the world's largest rainforest was destroyed between August 2017 and July 2018 - an area roughly five times the size of London. Environment Minister Edson Duarte said illegal logging was to blame. The figures come amid concerns about the policies of Brazil's newly elected president, Jair Bolsonaro. During the 2018 election campaign, Mr Bolsonaro pledged to limit fines for damaging forestry and to weaken the influence of the environmental agency. An aide for the president-elect has also announced the administration will merge the agriculture and environment ministries, which critics say could endanger the rainforest. The latest government data says most of the deforestation occurred in the states of Mato Grosso and Pará, and marked a 13.7% rise over last year's figures. Mato Grosso is the top producer of grains in Brazil, and critics say expanding agriculture is also encroaching on the rainforest. Mr Duarte blamed "an upsurge in organised crime" for the illegal deforestation, and said the country must broaden the fight against "environmental violations and in defence of sustainable development of the biome". Satellite data from the deforestation monitoring project known as Prodes informed the annual survey. While the rate does mark a significant rise from last year, when the rate of deforestation dropped 16% in a 12-month period, it still marks a 72% drop from 2004, when the Brazilian federal government launched measures to combat deforestation. In that year, an area the size of Haiti - more than 27,000 sq km - was cleared from the rainforest. The Amazon region holds the largest tropical rainforest in the world and is home to plant and animal species that are still being discovered by scientists. Most of its millions of square kilometres are inside Brazil, where under laws dating back to 1965, landowners must keep a percentage of their property forested.